Mental health and emotional well-being describes how we think, feel and relate to ourselves and others and how we interpret the world around us. Having good mental health affects our capacity to manage, communicate, and form and sustain relationships. It also affects our ability to cope with change and major life events. Most people will come into contact with mental health issues during their lifetime, and one in four will have personal experience of a mental health problem. The invisibility of mental illness means many do not receive the support and treatment that could help them. Nationally there has been an increased prevalence of mental ill health in children and young people, with only a small proportion with mental health problems in contact with mental health services. Around one in 10 children in Devon have a mental health disorder. The table below show the number of school-age children estimated to have a mental health condition by local authority district. Tier four specialist inpatient and day-patient care are for children who are suffering from severe and/or complex mental health conditions that cannot be adequately treated by community mental health services. According to the CAMHS Annual Report to the Devon Safeguarding Children’s Board, between 15 and 25 young people from Devon will be in inpatient care at any one time. The range and nature of risk behaviour from young people at tier four is broad and can include self-harm, suicide, physical consequences of low weight, absconding, aggression, sexualised behaviour, fire-setting, and safeguarding concerns. All of these can represent a risk to the young person and may represent a risk to other patients. These risks and behaviours are harder to manage if the young person is placed on a paediatric ward instead of in a specialist Children and Adolescent Mental Health Services (CAMHS) bed. There has been an increase within Devon of young people admitted to paediatric wards and to tier four units. Devon does not have specialist mental health beds in county (the nearest being in Plymouth, though the young people may be placed at a much greater distance if a more local bed is not available) meaning the majority of South West admissions have been to paediatric a ward on which staff may not have the specialist skills to support a mental health crisis. This means young people in crisis are being placed at great distances from their family and support networks and family members are unable to participate in supportive therapy. issues, such as those outlined in the protection from maltreatment sub-section. Reliable figures on the prevalence of self-harming are difficult to obtain, although work by the Social Care Institute for Excellence, suggest around 1% of children with a mental health problem self-harm (http://www.scie.org.uk/publications/briefings/briefing16/). 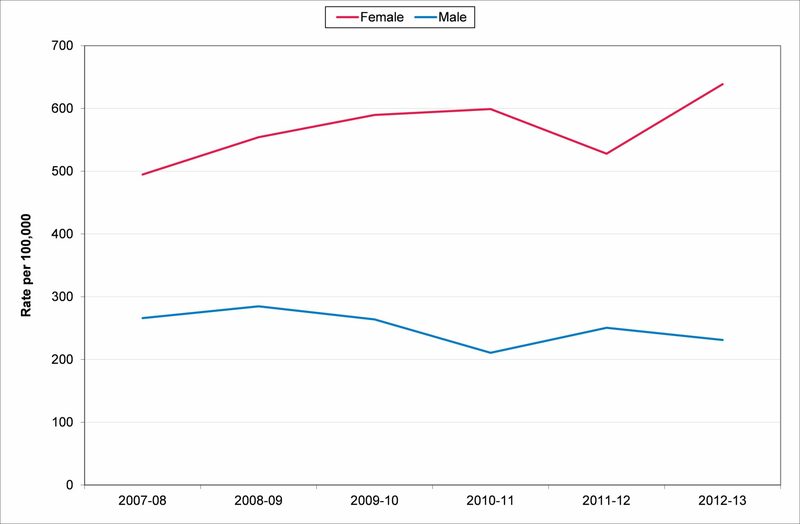 In Devon, 139 males and 409 females aged 0 to 19 attending accident and emergency departments as a consequence of self-harm in 2013/14. 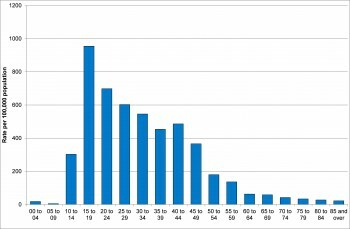 Attendance rates peak in the 15 to 19 age group as illustrated in the chart below. The Child Health and Maternity Service (CHIMAT) monitor self-harm admissions in the 10 to 24 age group. There were 548 hospital admissions for self-harm in persons aged 10 to 24 in Devon in 2012-13. The rate per 100,000 in Devon was 419.5, which is below the South West rate (442.5), but above the local authority comparator group (388.8) and England (346.3) rates. Admission rates increased from 376.6 in 2007-08 to 419.5 in 2012-13. Within the 10 to 24 age group admission rates were highest in those aged 15 to 19 (625.4). Admission rates also are higher in more deprived areas, with a rate of 1034.0 in the most deprived areas compared with 308.6 in the least deprived areas in 2012-13. Within Devon rates were highest in North Devon, and lowest in the South Hams and Torridge. 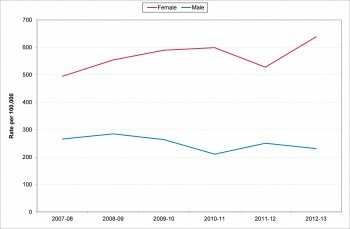 Rates of hospital admission for self-harm are three times higher in females than males and the gap has widened in recent years as illustrated in figure 8.14 below. Eating disorders usually start in the teenage years and are more common in girls than boys. The number of young people who develop an eating disorder is small, but eating disorders such as Anorexia Nervosa and Bulimia Nervosa can have serious consequences for their physical health and development. Table 8.10 highlights around 122 persons aged between 11 and 15 have an eating disorder. Around 15 new cases of Anorexia Nervosa and 17 new cases of Bulimia Nervosa are expected in Devon each year. 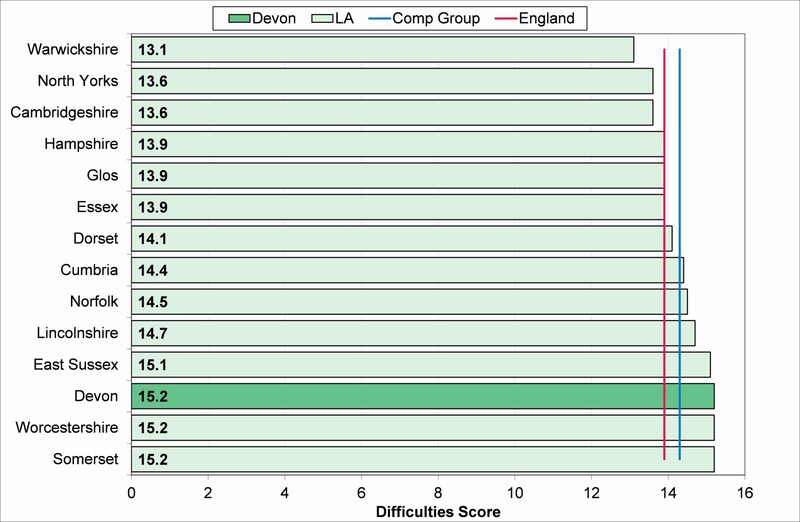 The difficulties score is collected through a strengths and difficulties questionnaire, with higher scores (on a scale of 0 to 40) highlighting greater difficulties. 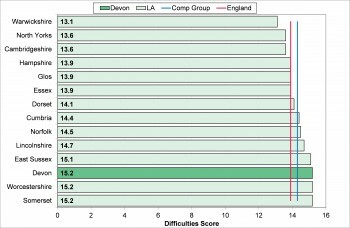 The average difficulty score in Devon was 15.2 compared which is higher than the South West (14.8), local authority comparator group (14.3) and England (13.8) averages. The average score has decreased since 2011-12 level and the gap to the regional and national average scores has lowered. Difficulties score tends to increase with age with teenagers having higher difficulties scores. The older age profile of children in care in Devon may well influence the higher average scores observed.